Playing card games is a great way to stay connected with your family on a Friday night. AND it’s easy. Start with a deck of cards, add a little competition, food and fun, and you’ll create a memorable family event. Family Card game night is even more fun when you ‘deal out’ these delicious snacks! 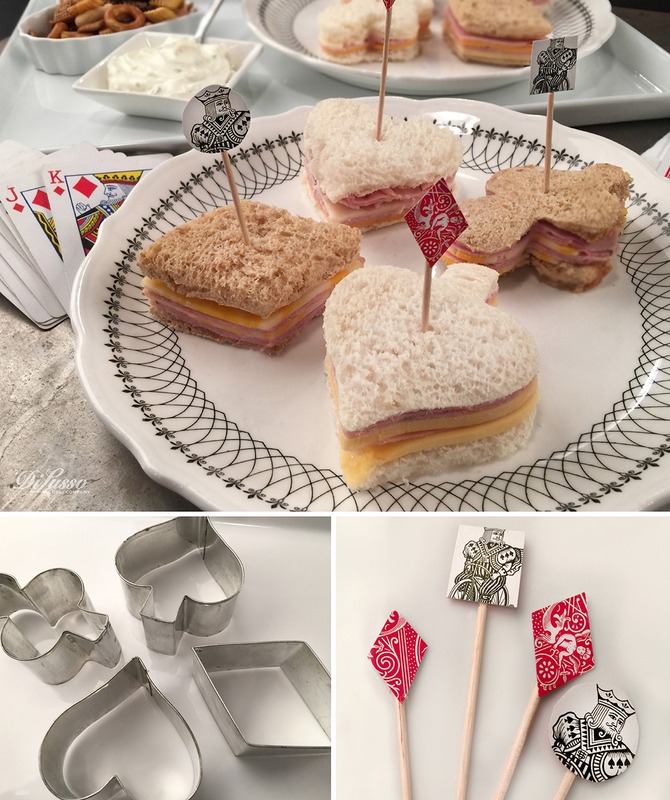 Your kids will love grilled cheese even more (if that’s possible) when you cut them out in diamonds, hearts, spades and clubs. The cutter shapes are readily available at cooking stores and online. Throw in a shark cutout and see who gets the joke! Go with a black and red card theme decor! Go Fish - This game is simple. Deal 5 cards to each player (if there are 4 or less, each player gets 7 cards) then take the remainder of the cards and place them face down into a pile in the center of the players. The youngest player always starts first and moves clockwise around the table. Start by asking another player if they have ________ card. If the opponent has the card, they pass it to the player. If they don’t they say, GO FISH! The goal is to get the most pairs until the center pile is gone. If a player runs out of cards, they need to pick 5 cards from the center pile. Slapjack - First take out all the jokers and then shuffle the cards together. Deal the cards face- down to your opponents. The starting player takes the first card off the top of their pile and places it on the table - if the card is not a Jack, the next player goes, repeating the process. If the card was a Jack, the first one to slap theJack wins the pile, taking all the cards underneath. (If there are no cards underneath, then just take the Jack.) The game goes on until one player gets all the cards.